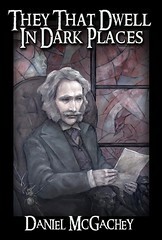 Daniel McGachey writes stories close in style and spirit to those of M R James; and at the moment I know that he’s also engaged in transcribing and editing the notes of one Dr. John Watson, Esq., with a view to their publication. I don’t know why Dan McGachey prefers to set his fiction over a century in the past; at a guess, I’d say that perhaps he feels he’s been born to late and his characters feel more comfortable in the soft glow of the gaslight. Buildings tended to be grander then – buildings like Mr Elmsmore’s house and estate in The Mound. And despite the industrial revolution, men and women were still close to nature, and more held in its thrall, like the men combing the sands, looking for survivors, in The Beacon. Perdew is a young and enthusiastic librarian there; but when Lawrence asks him to help find some old texts, he’s puzzled by Perdew’s reluctance to look in the cellars. At length Lawrence gets a strange story from him about some antique volumes found while rebuilding work was being carried out on the older parts of the library. The volumes had been curiously bound in a substance that even old Harkwell the bookbinder had been unable to identify. And shortly after their discovery a grotesque red form had been seen in the library. This story is adapted from McGachey’s Imagination Theater radio play, which was first broadcast October 2006 (directed by Lawrence Albert and produced by Jim French). The story’s first appearance in print was in The Second BHF Book of Horror Stories (BHF Books, 2007) edited by Christopher Wood. The Mound was posted to the original writers Workshop of Filthy Creation at the Vault of Evil forum, where Steve Goodwin and I saw it and wanted it for the 3rd issue of Filthy Creations magazine in Autumn 2007. The story opens with Mr Elmsmore surveying the gardens of his estate by moonlight, and noticing a curious irregularity of the ground where only a perfect lawn should have stretched. Instead of the lawn’s flatness, there is now, without doubt, a mound. And over the following days, the sinister protuberance appears to be moving closer. This is one of the shorter stories in the collection, and reading it again, I think it’s a grisly little gem. The Beacon: In summer, Bleakfall is one of the prettier seaside towns dotting England’s coast; but tonight, with the moon nearly hidden behind scudding clouds and a tempest beating down on the shore, men are searching the sands for survivors of disaster, and it’s Dr Pardoe who spies the shape of the boy in the boat. The boy seems confused; he claims to have come not from a shipwreck but from Drearcliff, the lighthouse situated some miles out at sea. And gradually a story is coaxed from him of a young woman found washed onto the rock near the light, a woman whose passion and need for justice is so strong that it acts like a beacon for other restless spirits of the deep – spirits who resent those who’ve not succumbed to the waters, and the light-keepers who warn the living away. The dead in the waters off Bleakfall shores want company. Shalt Thou Know My Name: Occult scholar Dr Lawrence is all set for a pleasant evening’s reading in front of a crackling fire, when his peace is disturbed by the arrival of his acquaintance Dower. The man’s arrival is a surprise – ‘Dour Dower’ isn’t known for socialising – and he’s obviously in a distracted state, and anxious to determine that Lawrence is really alone. He tells Lawrence about the time he was a student and had met the underhand Edgar Bright - who plagiarised his thesis. Bright had reappeared recently while Lawrence was researching the Heskith family archive at Seachester – an archive Bright is keen to investigate for his own purposes. Among the profusion of letters and dockets, Dower finds some pages written by Meriel Pearson – about to be hanged as a witch. Her writing tells of the burning of a sacred grove, and an unholy revenge carried out by a ghastly scarecrow thing, which comes when it’s name is spoken. Believing that Edgar Bright is planning to plagiarise his work again, Dower comes up with a plan to discredit him, and after a little creative editing of the archive, leaves it unguarded one night in the Seachester museum. The following pages, of course, relate the haunting of Edgar Bright, when the thing from the grove answers the calling of its name. The Wager: Vincent Style and Cardew are drowning their sorrows after a bad night at the card tables, when the even-more-inebriated Wheeler appears. A flippant remark about having a flutter with the Devil, prompts Wheeler to ask if they’ve yet visited the Club Tenebrosa. The other two are intrigued, but strangely it seems that Wheeler now regrets mentioning the club. Careful prodding reveals that the club is a moving game, it’s location known only to members who are informed by the sinister ‘messengers’. The games are never held in the same place twice, played in derelict abattoirs, hospitals, theatres. And membership of the club is by invitation only. The Crimson Picture: Dr Lawrence receives a letter from his old classmate Drayton inviting him to discuss a curious matter which he thinks will be of interest to him, for “such was always your forte.” When Lawrence observes that Drayton appears to have aged well and makes a joking remark that possibly he has a portrait hidden in his attic like the fellow in that Wilde story, Drayton reacts dramatically. There is a picture, and a story relating to it, but he wants Lawrence to hear the story from the person who told it to him. This slightly labyrinthine way of weaving into the plot is a technique I’ve noticed a lot of storytellers employ, casually drawing a reader down into the narrative. Drayton takes Lawrence to a picture gallery and tells him: “There is one picture I wish I had never brought before human eyes.” The picture is listed in a catalogue as “Unknown subject – A Portrait in Crimson.” Mysteriously, the artist is as unknown as the picture’s subject. That morning Lawrence had read a newspaper account of a commotion at the gallery when a picture had been slashed. Now it transpires that the picture was the crimson portrait, and the man who had attacked it, its artist – Hector Jardine, a man better known as a painter of landscapes. At last, in the presence of the crimson portrait, hidden behind a silk curtain, Jardine begins his story. And he tells how he was commissioned to paint the thing, and how, like Gericault, he found that perhaps he was not exactly painting “from the life”. Possibly this is Daniel McGachey’s most powerful story to date. ‘Possibly’, because I haven’t read them all. It’s assured, confident; and the first time that I read it, I felt a little queasy, as if the lines of text were actually seeping their gruesome descriptions. Rags: Jeremy Belstone is an Englishman taking a walking holiday in the Scottish Highlands. Finding that Scotland extends beyond Edinburgh and that most of it is wet, he wonders if the holiday was such a good idea. Things hit a new low when he becomes separated from his friends and has to contemplate the prospect of a night spent alone on the moors. And if that isn’t enough, he’s injured his foot. That’s when he sees the low roof of a ‘bothy’ ahead. The building has one dark, round room, and there are some sticks. But as soon as Belstone starts lighting a fire, he realises that he isn’t alone. There’s an old man in the room. The man remarks that Belstone must have come from the East, a route that would have taken him past the ‘Cloutie Well’. And he explains that this well is close by a tree festooned with knotted rags, and that Belstone should have bathed his foot in the well, for its waters were known to have curative powers. The story of the well and the rag-hung tree goes back before the time of the Clearances, when Scottish people were evicted from their homes by an English act of parliament. The rags were left as tokens of thanks by those cured by the well. Lord Walter Stourmont had thought Cloutie Well a challenge to his power over local people and had attempted to destroy it. But soon he learns that the well has its own unpleasant way of fighting back. The story, of course, does not end there. The Travelling Companion: One for the bibliophiles, who live for the experience of finding some treasured tome in the junk shop boxes. We know who we are! Waiting for a train, Endicott decides to while away the time by looking around an auction room. A keen reader, he’s pleased when, investigating the contents of a box, he finds Lot No. 169, a bundle of books tied with a black ribbon – one of the books in particular exciting his curiosity, a collection of ghost stories. Endicott succeeds in buying the lot; but just as he does so the auction room’s peace is disturbed by the entrance of a woman, who insists that the lot has been sold before she’d had a chance to bid for it. The auctioneer’s attempt to pacify her is futile, and Endicott finds that the volume she’s particularly interested in is the same one that he’s been pleasantly anticipating reading! Something about the woman disturbs him, and refusing her attempts to buy the book from him, he makes his escape. Aboard the train he has time to examine his purchase, and is delighted find that it’s Delve Not Too Deeply and Other Ghost Stories by an author he’s previously enjoyed reading, Dr. H. S. Grace. What’s more, the collection contains several stories that he hasn’t seen before. But settling to pass the journey pleasantly reading, he feels disquieted to discover that the stories aren’t quite as he remembers them. He becomes convinced that the endings are changed – in fact, quite horribly. And as he reads one after another of these not-quite-familiar stories, what should have been a comforting pastime becomes increasingly disturbing. For me, this story pressed all the right buttons; the bundle of books tied with a black ribbon, the train journey, the sense that reality is being shifted and something unpleasant is lurking behind the veil. Thoroughly enjoyed it. A Ravelled Tress: Christmas is coming, the snow lies round about, and three guests are visiting Blackmane Lodge, the new home of Roger and Elspeth Morgan: the often-divorced Geoffrey Wynngrave, his sister Alice, and Sir Nigel Fenwick, the impoverished owner of nearby Fenwick House. Geoffrey has an eye for the grotesque and is discussing one of Roger’s finds when renovating the house - a braided length of black human hair, about three feet long, which Roger had discovered in the cluttered cellar, and which is now hung above the fireplace. Curious in its own right, the hair seems even more bizarre when Roger shows them the mirror-lined casket that had held it. Some time after the dinner party has ended, Alice Wynngrave is awakened by the sound of ragged breathing and choking from the next room. Her hammering at the door wakes Roger, who finds his wife writhing and chocking beside him. Needless to say, this is not to be the only disturbed night that the Morgan’s and their guests will have, and shortly they begin to wonder if Blackmane Lodge is haunted. Geoffrey’s investigation turns up a disturbing story about the man who built the house, Gabriel Lockhart, and Luciana, the foreign wife he had brought home. Although she was not unfaithful to her husband, it was known that Luciana loved herself more, and believed that she could tempt any man. And here the story turns to one of jealousy, madness and murder, and the bizarre way Luciana had murdered her rivals by strangling them with their own hair. The denouement is presented curiously and interestingly through a kind of shared dream, when something ghastly begins a horrid dance near the glow of the flames in the fireplace, above which hangs Luciana’s braided hair. I reread it last night to see if I was overestimating its grandeur but I'm afraid I underestimated: Darkness, evil, twists and turns, characterisation, atmosphere, dread, angst and fear but most tellingly Pathos tumble off the page. And Still Those Screams Resound…: This one begins with Dan McGachey giving a welcome fleshing-out of Dr Lawrence. We learn for instance of the good doctor’s ability to recall so many of the bizarre incidents in his past in precise detail and re-enact them for his avid listeners. It’s worth mentioning, by the way, that Daniel often includes literary thumbnail sketches, recounted by Dr. L., which adds colour and detail to the stories, and makes me wonder if these suggest more stories which will be coming to us. Personally, I’d love to read a full account of “the grim chronicle of the travelling mausoleum, and its awful grinning proprietors”. We also learn of Dr Lawrence’s old History tutor at St James’s, Lucius Shadwell, when Lawrence is asked one night what has been the most evil presence of his experience. Shadwell’s interest in the bizarre and his constant quest for the supernatural had finally become a source of embarrassment to the board of St James’, and he had been effectively paid off, granted a generous settlement, on condition that he quit the college. He uses the money to purchase Wraithvale Priory, in the border country; and it’s to that grim place that he invites his former pupil. Wraithvale Priory not only has a suggestive name, it also looks everything that a haunted house should be, and as soon as they’re within its grounds, Shadwell urges Dr Lawrence to hurry so that they might see “my ghost”. And see it they do! 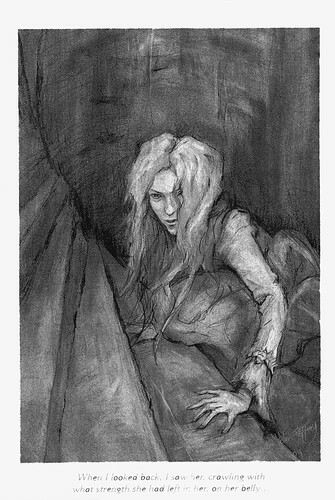 In a high turret room, a young woman appears and begins a grim re-enactment of a scene where she appears to be in abject terror of some unknown threat that lies yet beyond the human observers’ perception. The scenes with the ghost are definitely creepy, their most frightening aspect being our awareness that as the scenes gain in clarity, so we are getting closer to learning the reason for the girl’s terror. We also learn more of Shadwell and his sick wife Meredith, who Dr Lawrence knows of old and fears for in this lonely house with its far from silent visitations. Another one to add to a growing list of favourite Dan McGachey stories. An Unwise Purchase by Dr H S Grace: This story opens with Daniel McGachey’s introduction, in which we learn that the late Dr Grace, aside from publishing several scholarly reference works, also published three volumes of supernatural tales. Daniel’s introduction is something I’d prefer the reader to enjoy without unnecessary comment of mine; enough to say that he presents this tale by Grace “in tribute to an author whose work has had such an effect on my own”. The story begins when Dr Henry Hartwell visits Mr Barnabus’s antique shop and is shown a brass representation of the Three Wise Monkeys. Hartwell doesn’t like the piece, but after a disturbance caused when a strange voice warns him of the presence of a thief in the shop, he decides that the piece might indeed warrant closer examination, he takes it home. It quickly becomes clear that as long as Hartwell has the monkeys, no one will be able to deceive him. The monkeys see and hear all, and they tell Hartwell everything. Liars are found out, cheats exposed, and soon Hartwell becomes a force to be reckoned with at the university. He wants to be considered for a senior post which is about to become available, and to that end he invites the Dean and several other members of the college staff to his apartment. Without dwelling on details and spoiling the story, the party soon warms up dramatically, and more than one guest regrets accepting the invitation. But not everyone is willing to be cowed by his apparent omniscience, and before long Hartwell begins to regret his purchase. The Unmasking: An Evening of Revels and Revelations: Professor Burwell, the Dean of Montague, is keen on wooing a new prospective benefactor for the university, and to that end intends making him guest of honour at a masked ball. All staff are expected to attend - news that Dr Lawrence receives with displeasure as he prefers staying closeted in his room, engrossed in private studies. Burwell and Lawrence don’t see eye-to-eye at the best of times, as the Dean is a forward-thinking man keen on science and technology, while Lawrence is a historian. Mr Pargetter the Chaplain is another progressive thinker and is determined to rewrite ancient texts so that they’ll have more meaning in the present day. Knowing Dr Lawrence’s dislike of formal college functions, the Dean is prepared when Lawrence claims that he’s been too late to rent a suitable fancy dress: Burwell shows both him and the Chaplain, to a room where three antique china masks lie. As the three emerge wearing the masks, Lawrence experiences an odd darkening of his vision. The guest of honour has arrived, and the other guests seem now to be wearing costumes quite unlike the gaudy things they wore at the start. Lawrence doesn’t know the identity of the guest of honour, but it quickly becomes apparent that, whoever he is, he’s not sympathetic to the progressive thinking of either the Dean or the Chaplain; his interests and beliefs seem more attuned to the deeply buried past and the ancient buildings around them. They That Dwell in Dark Places: The last story in this trade paperback edition was actually the first to be written, Daniel explains in the story notes. He explains that he began the story October 30th 2004, “due to my irritation at another Halloween approaching with no plans set to celebrate”, with the intention of emailing the story to a few friends. The story concerns a gathering of friends who are spending the evening in traditional Halloween fashion, telling a series of increasingly spooky stories, until a young man protesting at the ghoulishness of the talk interrupts the evening. Shortly he apologises and explains that he had once been an obsessive reader of such stories, until his interest had shifted to actually seeking out the unexplained for himself. But what he had seen at a reputedly haunted house had left him with a horror of parted curtains and a fear that when he had left the house he had taken something with him. The story is the shortest in the book, and succeeds in Daniel McGachey’s intention “that it should attempt to capture the feel of the Fontana Ghost Story anthologies and those Amicus portmanteau films beloved of our little group”. This as I said completes the stories in the trade paperback edition of this book, though in fact, for the limited edition, Daniel was asked to write two more stories, and I’ll be covering those, too. I’ve very much enjoyed reading this collection. One of my personal favourites is The Travelling Companion, which immediately struck a chord for me with its chance find of a rare book in an auction room crate, then the descriptions of the stories within the book providing chills within chills. Finishing They That Dwell I was left with a feeling that the individual stories belonged to a greater whole; that places like Wraithvale and Greymarsh could be found on a map – and possibly that map is the one illustration that could have been added to the book. To sum up, Charles Black, with his own liking for smoking room stories, was a natural choice to write the introduction; Julia Helen Jeffrey has provided a number of attractive illustrations; and the pages of detailed author’s notes on the stories underline Daniel’s enthusiasm and professional attitude to his excellent writing.